A Darker Shade of Magic by V.E. Schwab has been on my TBR for FOREVER, and I never seemed to have the time to get to it, even though I really, really wanted to. When I started working on my Fall TBR list back in the summer, I added the book to it, and I was determined to read it no matter what. It took me a little while to get to it, but I did finally read the book, and I absolutely Loved it! To be honest, I really didn't know what to expect when I started reading this book. I knew that the book was really popular, and that most everyone I had talked to that has read the book has loved it, but I purposely stayed away from reviews because I didn't what to know too much before starting it. So, other than briefly reading the summary, I went into the book without knowing anything. I wanted to go with the flow to see where the story took me, and I am so glad that I did it this way. The story completely blew me away! There's so much about it to love, including the characters, particularly Lila, who was quite the badass, as well as Kell, who I found completely mysterious. Having finished the book, I find myself wanting to know MORE about them, and I can't wait to meet them again in the next book! The storyline was definitely creative and unique as well. It's been a while since I've read a book about magic, and I never really know what to expect when starting a new one. I can't say that I've read any book like this before, and I love that it was so unique, and it really held my attention as I turned the pages. 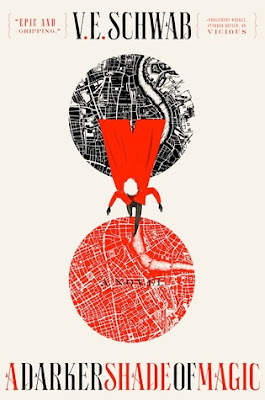 The descriptions were great as well; I could envision everything perfectly in my mind, and I wanted nothing more than to climb in the pages and be in the different London's with Lila and Kell. (Ok, maybe not ALL of the London's, but you know what I mean. *wink*) I'm super excited to continue the series so that I can dive back into this world that Victoria has created. Overall; I really enjoyed reading A Darker Shade of Magic, so much more than I expected to! (People totally tried to warn me that I would love it!) I'm really wishing that I would have read the book sooner, but now that I finally have read it, I can't wait to continue on with the rest of the series as soon as possible. If you've not yet checked out A Darker Shade of Magic, I highly recommend that you do so!